To get to know another group member and to report to the rest of the group what was learned. Ask them to exchange contact information (email or phone numbers). Explain that their task is to interview each other by developing questions that they would ask to help them get to know someone better, and texting or emailing their questions and answers back and forth. 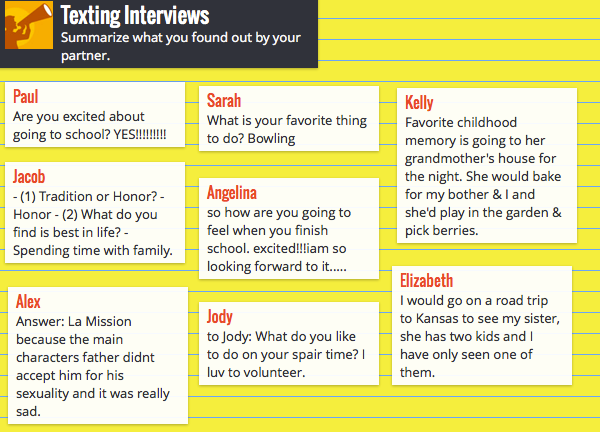 Interviewers summarize what they found out about their partners by posting the partner's name, the question asked, and the response received on a Sticky Note Board such as Wallwisher. This way all the members can learn about one another. Follow-Up: Encourage the paired members to use one another for support during the class or program.